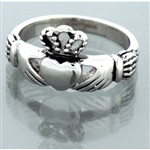 How sweet is this traditional Claddagh ring. Love (heart), loyalty (crown) and, friendship ( hands). A traditional vow of," with these hands I give you my heart and crown it with my loyalty." We have made this friendship ring with 316L Stainless steel. That means NO TARNISHING and great for people with allergies. This will become an everyday ring that you can wear and never take off. Richard Joyce and his amazing love story from long ago designed the first claddagh in Ireland. -316 L Stainless Steel does NOT tarnish or rust. It is very hard and durable. It has a beautiful luster that can be buffed and polished to remove fingerprints or scratches. -The traditional way to wear a Claddagh ring is if you are single, wear it on your right hand with the heart pointing out. If engaged, you wear on your right hand with the heart pointing in towards your heart. Once married, move your ring to the left finger with the heart pointing in towards yours.